Thanksgiving is quickly approaching, which means, food, family, friends and FRENZY as the preparation begins! Molly Maid has assembled 2014’s tips to help make house cleaning chores more manageable. Scrub your entryway. Wipe down your front door, shake out the doormat and make sure dust and dirt haven’t collected on floors and furniture legs. These are the first things guests will see when they arrive, so keeping them clean will guarantee a good first impression. Focus on the kitchen. People tend to gather around the food during the holidays, so make sure your kitchen looks and smells nice. Don’t forget to dust the light fixtures and flush sink drains with boiling water. Get the kids involved! Make it fun by turning on some holiday music or making games out of cleaning like playing basketball while sorting laundry. Many kids respond well when they know what is expected so a chore chart may be helpful. Having a reward at the end of the week is particularly motivational – an extra dessert, extended bedtime or even a toy or allowance. Ensure your home is “company ready” anytime with only 15 minutes a day. Make the bed every day or at least straighten the covers each morning. Pick up mail, toys, keys and loose change each evening. In bathrooms, squeegee shower doors and walls. 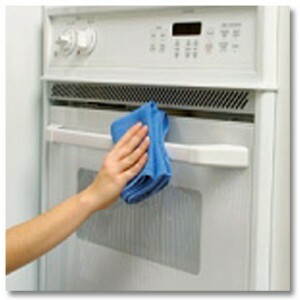 Wipe off counters and sinks after every use. Most homes typically encounter a few spills or cooking casualties, so use our ideas below to remove the most common issues when your party’s over. Cleaning Glassware and Remove Hard Water, Lipstick & Coffee Stains: For hard water and lipstick stains, wash your glasses in warm soapy water and add a half cup of white vinegar. If you soak them in the vinegar overnight that will help to loosen and remove the stains. Wine on the Carpet: First, it’s important to act quickly. Don’t let the stain set for long before you spring into cleaning mode. A little bit of salt on the stain will help prevent the stain from setting into the carpet and prevent larger problems. You have a few options for removing the stain – white wine, club soda, and commercial carpet cleaner products are the most popular. Simply pour your cleaning solution of choice onto the stain, and then gently blot up as much wine as possible. Remember – rubbing will force the stain into the carpet and make cleanup more difficult. Burnt Pots, Pans and Casserole Dishes: The best-kept secret is using Pepsi or Coke to remove burnt stains from pots. Pour in the pop, let it sit overnight and the stains practically wipe off. Buff out Hardwood Floor Scuffs: You can buff out most scuffs on a polyurethane hardwood floor by rubbing the area vigorously with a soft cloth. If this doesn’t fully remove the scuff, use a small amount of floor cleaner and vigorously rub the area with a soft cloth.